As we view the scene before us, we are standing near the bank of Plum Run Creek, which is behind us and looking north-northwest at the Devil’s Den. We see an officer urging on the men of the 17th Georgia. They are contending with infantry fire from the front (the crest of Little Round Top) and left flanks (Houck’s Ridge, where the 99th Pennsylvania has wheeled to there left rear and is raining down heavy fire on the Rebs), as well as canister fire from a two-gun section of Captain James Smith’s 4th New York Light Artillery. The 17th Georgia, from Benning’s Brigade, Hood’s Division, were in the second wave of Confederate troops to sweep through the "Slaughter Pen,” the boulder-strewn gorge through which Plum Run Creek flows, just to the south of the Den. Along with the 2nd Georgia, they had attempted to reinforce and bolster the attack of the 44th and 48th Alabama of Law’s Brigade, which has now stalled completely. 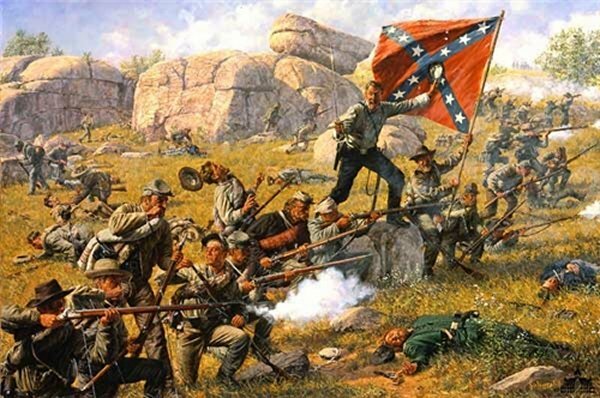 The dead Yankees in the painting belong to the 4th Maine, which was pushed out of Devil’s Den by the 44th Alabama earlier in the fight. The surviving men of the 4th Maine now huddle several tens of yards in the rear of the Georgians. The green-coated captain in the right foreground is from the 2nd U. S. Sharpshooters, one of two regiments of crack shots raised by Colonel Hiram Berdan in 1861. They were deployed as skirmishers this day, before Hood’s division began its assault and part of the regiment has retreated through Devil’s Den.